While it's fair to say that "Linsanity" has subsided, it was exciting to see an under-appreciated, unproven, Harvard man take over New York City and the country for the better half of a season. 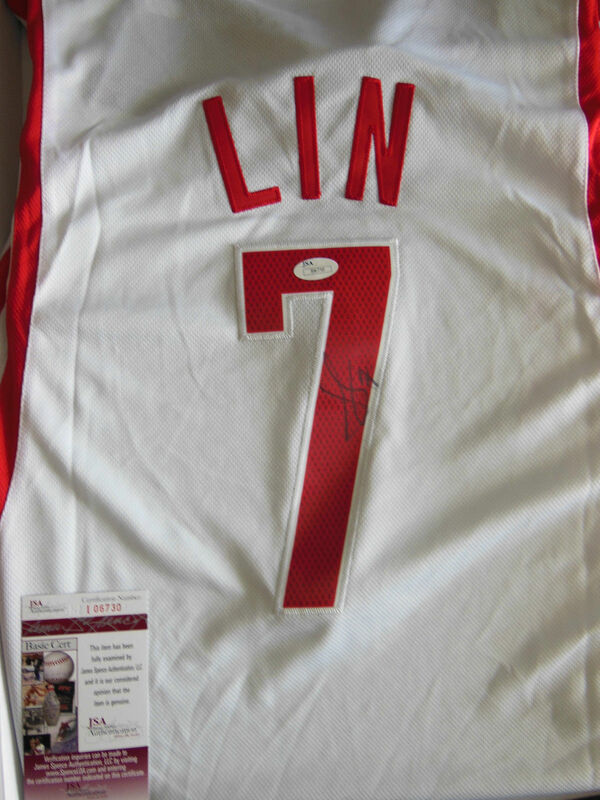 It sparked huge sales for Jeremy Lin cards and memorabilia, if even for a short time. But his notoriety isn't gone completely. Lin is still a popular face in the NBA. Although his career has seen him move to several teams, including the Warriors, Knicks and Rockets, Lin returns to the spotlight with the Los Angeles Lakers. 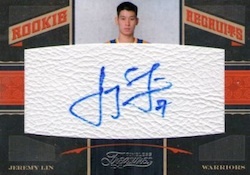 Given that his last period in a large market resulted in his hobby breakout, it is fair to assume an uptick in interest in Jeremy Lin cards and memorabilia. Still, given that he will be more of a complimentary player to Kobe Bryant, there is still a ceiling on his values that will tough to overcome. 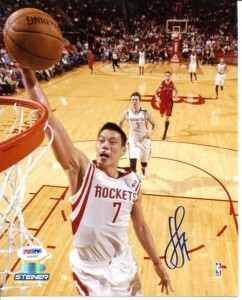 As an un-drafted rookie in 2010, Lin has just eight rookie cards, which contributes significantly to their values. 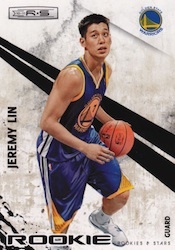 All Jeremy Lin cards, even base versions, have previously sold well on the secondary market. 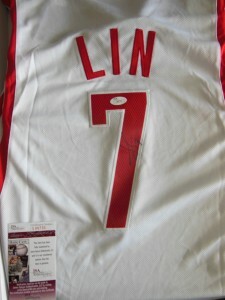 His move to the Lakers provides further upside for Lin's cards and memorabilia as the team enjoys considerable popularity and media exposure. 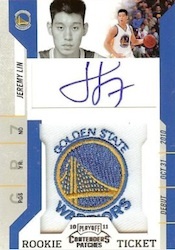 Although many collectors do not care for manufactured patches, this card has a good design with the colorful Golden State logo patch and an autograph. 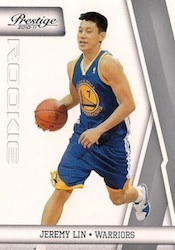 The best of the true rookie Jeremy Lin cards, there is also a short-print version with a secondary logo that is number 191 in the set. 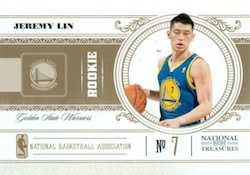 The 2010-11 Playoff National Treasures Jeremy Lin rookie card would be the undisputed top of his first cards if it was autographed. Numbered to 99, it still carries the strong reputation of the National Treasures brand. Autographed National Treasures Century parallels have brought in the highest values among Jeremy Lin cards. But because they are inserts, they are not true rookies. With only three autographed Jeremy Lin rookies, 2010-11 Timeless Treasures makes the list due to its lower numbering than the Classics version. The card design leaves much to be desired, but it does boast a large signing area and low print run. Sweet SP Basketball AUTO JERSEY card lot(23 total 8 #D 4 PRIZMS)!ALL SCANNED! Jeremy Lin 2010-2011 Prestige Gold Bonus Shots Rookie Card #210. 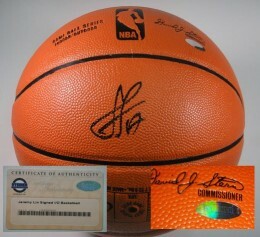 Below you will find an example of what Jeremy Lin's authentic signature looks like. This can be used as a first point of reference for determining the legitimacy of autograph memorabilia, but is not a substitute for having your items authenticated by a well-respected professional autograph authentication company. Reputable authentication companies include JSA, PSA, Panini Authentic, Upper Deck Authentic, Tristar, Steiner and Mounted Memories to name a few. Click on any of the images below to view full size photos. Signed on a relatively even horizontal plane, the signature may exhibit a slight up-ward angle, with a slight lean to the right. The letter "J" is larger than the other letters, very legible and written in cursive with an angular triangle-like loop at the bottom. The only other letter of the first name is a pronounced "y" with a curl that in itself resembles a "j." A character that looks like the letter "s" separates first and last name. The letter "L" is almost equal in size to the "J" but with a more rounded triangle like shape. A dash implies the letters "i-n."
He ususally includes his jersey inscription as "#7."